Every Home requires a Remote Tester because we are now using a number of Remote controlled Gadgets like TV, Home theater system etc. The Remote handset emits invisible pulsed Infrared rays which controls the functions of gadgets based on the pulsed data arriving. The Infrared Receiver LED (Rx) or a Photo module in the gadget senses this pulsed IR rays and makes the gadgets function accordingly. The Infrared Emitter LED (Tx) in the remote handset is similar to an ordinary LED but emitting Infrared rays in the wavelength around 900 nanometres. This wavelength is beyond our Spectral response, so we can’t see it. So what will do to confirm whether the Remote handset is working or not. If this tester is not available, we have to go to the shop to purchase a new one. Sometimes, it may be due to battery problem. 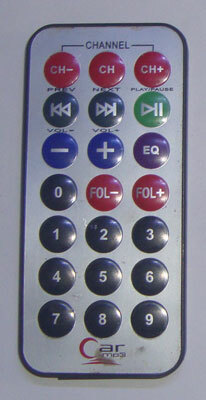 Let us make one tiny Remote tester. It blinks an LED if the Remote is good. Its cost is only Rs.25. What will do if you want a low voltage less than 3 volts as reference voltage for a circuit? Usually we use a low volt Zener to give low voltage to a particular section of the circuit. But Zener below 3.1 V is not available. So do this simple method. 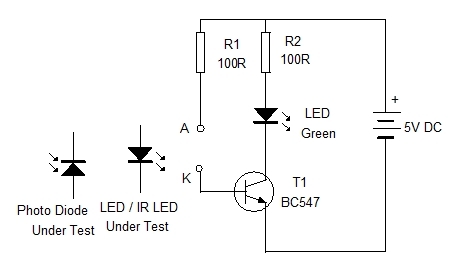 The LED can act a Zener to give a reference voltage. Each type of LED has a forward voltage drop that range between 1.7 V to 3.3 V. This forward voltage drop slightly increases when the input voltage increases. This is due to the increase in the luminosity of the LED. So let us exploit the LED to do the job of the Zener. This design note explains how to design an invisible alarm system easily. 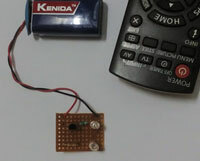 Infrared Transmitter ( Tx) and Receiver ( Rx) LED pair is easily available which can be used for making this alarm system. Infrared transmitter LED emits infrared rays in the wavelength around 950 nm. This LED is a high current device that can handle more than 100 mA current. 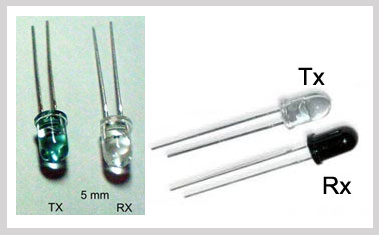 The IR receiver LED is a kind of Photodiode that generates a Photo current when it receives IR rays. So the IR LED pair is ideal to make an alarm system that operates both day and night. Photo interruption Module is used in the electronic circuits of automatic packing and sealing machinery using conveyor belts. The conveyor belt having equally spaced holes passes through the slit of the module.When the hole in the belt reaches the interruption module, the circuit will be activated / de activated. Here describes the working of the Photo interruption module. Here is an Infrared transmitter circuit for emitting pulsed IR rays with a frequency of 4.5kHz for Phototransistor based receivers. The range of the IR transmission is around 1 meter. Unlike 555 IC based IR transmitters, it uses the Phase Locked Loop (PLL) IC as an oscillator. Phototransistors are more responsive to Pulsed IR rays than direct light.